Gigarocket Forum > Web Development & Graphic Design > WordPress Discussion, Plugins, Design, Support and Security > [solved] Does newest WordPress allow user roles editor, author, etc? [solved] Does newest WordPress allow user roles editor, author, etc? I want to allow another user to make posts and be able to view unpublished content. I see from documentation that WP used to have several distinct roles, but now by default new users get no privileges and the only choice I see is"super admin". Is there a way, perhaps with a plugin, to give editor privileges to a user without making them an admin? I am aware that wp is trying to improve security, and I see a lot of features I'm impressed with. Perhaps security is the reason they limit users to minimal privileges or superuser only? If so, will allowing intermediate privileges weaken site security overall, or only increase the risk of users with poor security practices causing danger? Reference to discussion of the security changes and issues would be appreciated. This is news to me @SonLight . Will check up and let you know. When you create a new user you need to click on the down arrow next to "subscriber" and you'll find the other user roles that are available for selection. Ok, that was a little confusing. To *change* the status of an existing user, you must go to "add new user" which has the "add existing user" option. I was expecting a separate "modify user" option somewhere. Apparently I didn't notice the role field when I initially created the user because I didn't want to send an email and I skipped over the preceding field. Thanks for the explanation. I'm almost certain that the option to change the reputation of an existing member is there. I've used it a few times, but I have sympathy with your frustration, as I remember I fumbled a little with searching for it before I found it. WordPress can be frustrating that way. You have to click on users in the dashboard, there will then be a list of users appearing. You then have to click on the user whose reputation you want to change, and then at the bottom of the user list you'll find where you can change the role of the user by scrolling to the user role you want to assign the user and then to click on "change" next to it. Thanks for the additional info. I guess i should have marked this [solved], since I was able to do what I wanted. You showed how to set user role for a new user the first time you posted, which would have been something I could live with but a poor limitation. 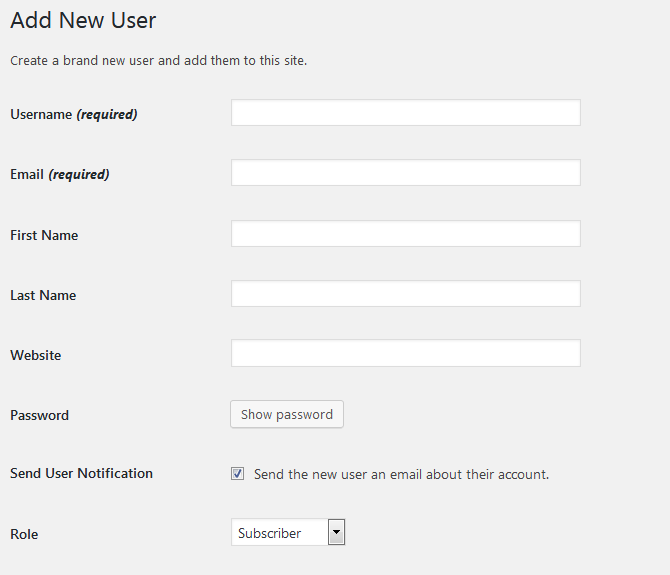 But the "new user" form has a "modify existing user" option on the page. That was what I used, and it has the same options. I looked at the documentation you posted, and it looks like there is another way, by selecting from "people". I'll probably try to do that the next time I want to make a change, but by then I won't remember the details, so if it's not fairly intuitive I'll start at "add new users" again -- I'll **never** forget that! PS. I did edit the thread title to mark it solved. I'm not sure if that's the best practice, but it seems to be the manual version of the built-in feature in the hosting support section.